Can you confirm these amateur observations of Sepsina angolensis? Distribution N Namibia, Angola, W Zambia, W Democratic Republic of the Congo (Zaire). Types Holotype: lost, MB (also as MBL = Museu Bocage, Lison) (lost in fire that destroyed that collection in 1978; Duque de Braganca, Angola, collected F.A.P. Bayão. Diagnosis Diagnosis (genus): Skull diameters: Palatine bones widely separated along the midline; palatal rami of pterygoids expanded medially with a tendency toward emargination posteriorly; pterygoid teeth present. Postorbital bone present and relatively well developed; supratemporal arch strong and fenestra well developed; 12 to IS maxillary teeth. External characters: Interparietal small, not touching supraocular scales; a pair of supranasals meeting behind rostral; external ear opening present; digits 4-4 or fewer [from GREER 1970]. Comment Synonymy: Both Boettger 1887 as well as Hewitt 1927 describe Sepsina hessei as “sp. nov.” Sepsina grammica is a synonym of Sepsina angolensis following a note in the MCZ type catalogue (which has the type of S. grammica). 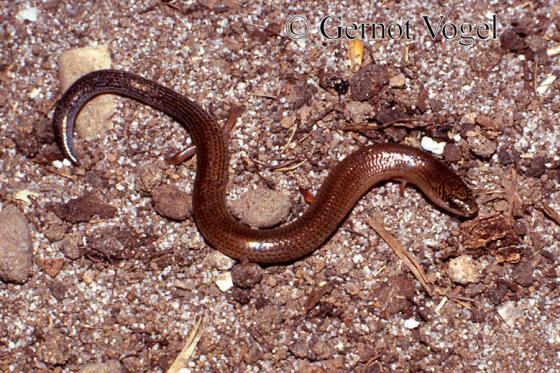 Type species: Sepsina angolensis BOCAGE 1866 is the type species of the genus Sepsina BOCAGE 1866. Bocage, J. V. Barboza du. 1896. Mammiferos, aves e reptis da Hanha, no sertào de Benguella. Jornal de Sciencias Mathematicas, Physîcas e Naturaes, Lisboa (2) 14: 105-114.